Every day, we see people building things. Sometimes, useful things. Very rarely, this thing becomes a product, but even then we don’t hear much about the ins and outs of manufacturing a bunch of these things or the economics of actually selling them. This past weekend at Shmoocon, [Conor Patrick] gave the crowd the inside scoop on selling a few hundred two factor authentication tokens. What started as a hobby is now a legitimate business, thanks to good engineering and abusing Amazon’s distribution program. The product in question is the U2F Zero, an open source U2F token for two-factor authentication. It’s built around the Atmel/Microchip ATECC508A crypto chip and is, by all accounts, secure enough. It’s also cheap at about $0.70 a piece, and the entire build comes to about $3 USD. All of this is hardware, and should be extremely familiar to the regular Hackaday reader. This isn’t the focus of [Conor]’s talk though. The real challenge is how to manufacture and sell these U2F dongles, a topic we looked in on back in September. The circuit for this U2F key is basically just a crypto chip and a USB microcontroller, each of which needs to be programmed separately and ideally securely. The private key isn’t something [Conor] wants to give to an assembly house, which means he’s programming all these devices himself. For a run of 1100 units, [Conor] spent $350 on PCB, $3600 for components and assembly, $190 on shipping and tariffs from China, and an additional $500 for packaging on Amazon. That last bit pushed the final price of the U2F key up nearly 30%, and packaging is something you have to watch if you ever want to sell things of your own. For distribution, [Conor] chose Fulfillment By Amazon. This is fantastically cheap if you’re selling a product that already exists, but of course, [Conor]’s U2F Zero wasn’t already on Amazon. A new product needs brand approval, and Amazon would not initially recognize the U2F Zero brand. The solution to this was for [Conor] to send a letter to himself allowing him to use the U2F Zero brand and forward that letter to the automated Amazon brand bot. Is that stupid? Yes. Did it work? Also yes. Sales were quiet until [Conor] submitted a tip to Hacker News and sold about 70 U2F Zeros in a day. After that, sales remained relatively steady. The U2F Zero is now a legitimate product. Even though [Conor] isn’t going to get rich by selling a dozen or so U2F keys a day, it’s still an amazing learning experience and we’re glad to have sat in on his story of bootstrapping a product, if only for the great tip on getting around Amazon’s fulfillment policies. Raspberry Pi boards (or any of the many similar boards) are handy to leave at odd places to talk to the network and collect data, control things, or do whatever other tasks you need a tiny fanless computer to do. Of course, any time you have a computer on a network, you are inviting hackers (and not our kind of hackers) to break in. We recently looked at how to tunnel ssh using a reverse proxy via Pagekite so you can connect to a Pi even through firewalls and at dynamic IP addresses. How do you stop a bad guy from trying to log in repeatedly until they have access? This can work on any Linux machine, but for this tutorial I’ll use Raspberry Pi as the example device. In all cases, knowing how to set up adequate ssh security is paramount for anything you drop onto a network. Last month, GitHub users were able to buy a special edition Universal 2nd Factor (U2F) security key for just five bucks. [Yohanes] bought two, but wondered if he could bring U2F to other microcontrolled devices. he ended up building a U2F key with a Teensy LC, and in the process brought U2F to the unwashed masses. Universal 2nd Factor is exactly what it says on the tin: it doesn’t replace your password, but it does provide a little bit of extra verification to prove that the person logging into an account is indeed the person that should. Currently, Google (through Gmail and Google Drive), Github, Dropbox, and even WordPress (through a plugin) support U2F devices, so a tiny USB key that’s able to provide U2F is a very useful device. After digging into the U2F specification [Yohanes] found the Teensy LC would be a perfect platform for experimentation. A U2F device is just a USB HID device, which the Teensy handles in spades. A handy library takes on ECC for both AVR and ARM platforms and [Yohanes’] finished U2F implementation is able to turn the Teensy LC into something GitHub was selling for $5. It should be noted that doing anything related to security by yourself, with your own code is dumb and should not be considered secure. Additionally, [Yohanes] didn’t want to solder a button to his Teensy LC, so he implemented everything without a button press, which is also insecure. The ‘key handle’ is just XOR encryption with a fixed key, which is also insecure. Despite this, it’s still an interesting project and we’re happy [Yohanes] shared it with us. Because people are generally idiots when it comes to choosing passwords — including people who should know better — Google created Google Authenticator. It’s two-factor verification for all your Google logins based on a shared secret key. It’s awesome, and everyone should use it. Actually typing in that code from a phone app is rather annoying, and [Alistair] has a better solution: an Authenticator USB Key. Instead of opening up the Authenticator app every time he needs an Authenticator code, this USB key will send the code to Google with the press of a single button. The algorithm behind Google Authenticator is well documented and actually very simple; it’s just a hash of the current number of 30-second periods since the Unix epoch and an 80-bit secret key. With knowledge of the secret key, you can generate Authenticator codes until the end of time. It’s been done with an Arduino before, but [Alistair]’s project makes this an incredibly convenient way to input the codes without touching the keyboard. The current plan is to use an ATMega328, a real-time clock, and VUSB for generating the Authenticator code and sending it to a computer. Getting the secret key on the device sounds tricky, but [Alistair] has a trick up his sleeve for that: he’s going to use optical sensors and a flashing graphic on a web page to send the key to the device. It’s a bit of a clunky solution, but considering the secret key only needs to be programmed once, it’s not necessarily a bad solution. With a small button plugged into a USB hub, [Alistair] has the perfect device for anyone annoyed at the prospect at opening up the Authenticator app every few days. It’s not a replacement for the app, it just makes everything easier. [DarkFader] sent in his build that implements two-factor authentication on a Sony PocketStation. The PocketStation was a PS1 accessory intended to be a competitor to the Dreamcast VMU. [DarkFader] wrote an app for his PocketStation using a fabulous PocketStation emulator and uploaded it with the PS3 memory card adapter and MCRWwin. The PocketStation app (available here) takes a key and hashes it with the current time to generate a six digit code. Combined with Google’s support for two-factor authentication, [DarkFader]‘s memory card provides access to his Google profile. 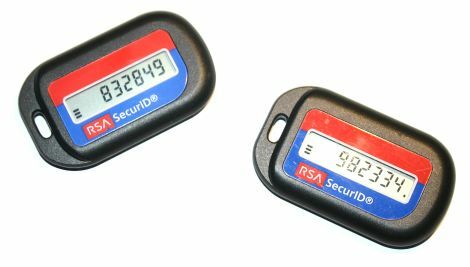 Two-factor authentication is also used in RSA SecurID key fobs that were compromised earlier this year. This lead to a huge number of companies being penetrated. For a single person, obscurity is a reasonable (but still ultimately futile) means of providing a little more security, but a PocketStation hack is still pretty cool. Check out the video after the break that shows [DarkFader] using his PocketStation token.